“I believe we will remain in charge of the technology for a decently long time and the potential of it to solve many of the world problems will be realised,” said Rollo Carpenter, creator of Cleverbot. Cleverbot’s software learns from its past conversations, and has gained high scores in the Turing test, fooling a high proportion of people into believing they are talking to a human. Mr Carpenter says we are a long way from having the computing power or developing the algorithms needed to achieve full artificial intelligence, but believes it will come in the next few decades. “We cannot quite know what will happen if a machine exceeds our own intelligence, so we can’t know if we’ll be infinitely helped by it, or ignored by it and sidelined, or conceivably destroyed by it,” he says. But he is betting that AI is going to be a positive force. 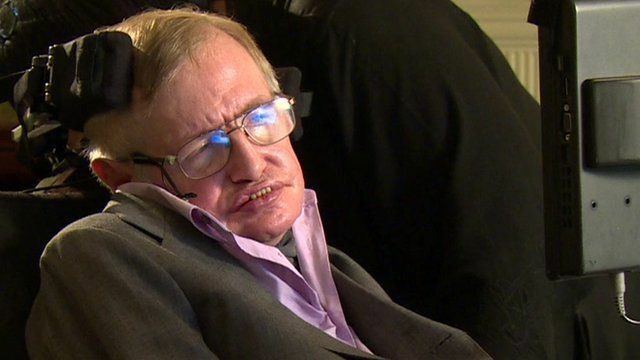 In his BBC interview, Prof Hawking also talks of the benefits and dangers of the internet. But one aspect of his own tech – his computer generated voice – has not changed in the latest update. Prof Hawking concedes that it’s slightly robotic, but insists he didn’t want a more natural voice. “It has become my trademark, and I wouldn’t change it for a more natural voice with a British accent,” he said.